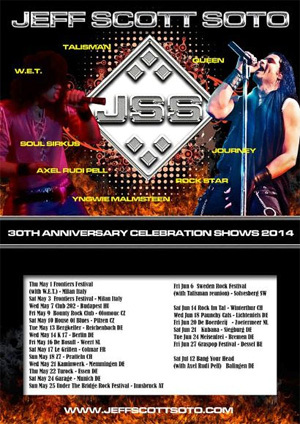 JEFF SCOTT SOTO started his career back in 1984 at the ripe age of 18 years old with the 1st international incarnation of YNGWIE MALMSTEEN'S RISING FORCE. This year, he celebrates 30 years of his musical path (Yngwie, TALISMAN, JOURNEY, AXEL RUDI PELL, ROCK STAR) by hitting Europe at some of the premier festivals and a selection of club dates by revisiting the favorites of his life. Along with his latest line up including Jorge Salan (guitar), BJ (guitar/keys), David Z (bass) and Edu Cominato, the setlist will include some of the mentioned releases that Jeff has not performed live in many years.